XR-PRO (Refurbished) - Glidecam Industries, Inc. The Glidecam XR-Pro’s all-new, and meticulously designed, features combine the best of the XR-Series creating a system that now accommodates a wide range of cameras. 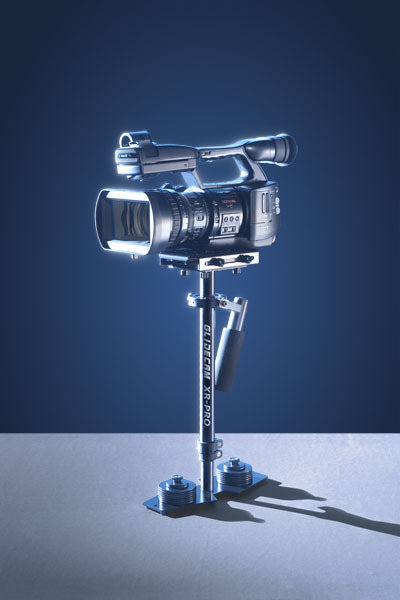 Designed for film and video cameras weighing up to 10 lbs. (4.53 kg. ), the lightweight Glidecam XR-Pro will transform your hard to watch, shaky camera footage into hypnotically smooth, professional footage. With the Glidecam XR-PRO hand-held Stabilizer your camera seems to float, always balanced, isolated from your hands undesirable motions. Now you are free to move with your camera – panning, tilting, booming or running without any camera instability or shake. The Glidecam XR-PRO works so well that it allows you to shoot incredibly smooth and graceful shots even while going to extremes like running up and down stairs or traveling over rugged terrain. And, when it comes to normal shooting, like walking or moving the camera slowly around someone, the results are equally magical. 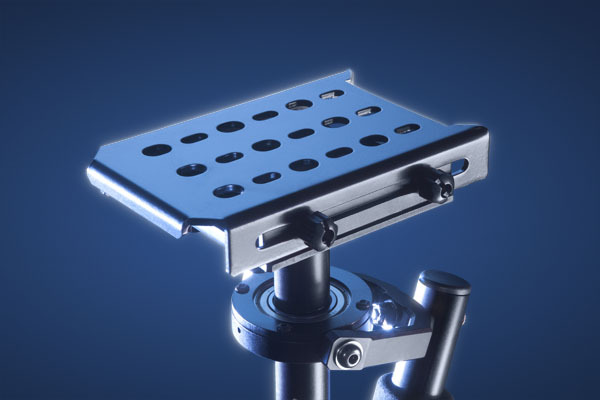 The Glidecam XR-PRO Base Platform. Total Weight is 2 lbs.1.6 ozs. without Counter Weight Discs. Each large Counter Weight Disc averages 2.75 ozs. Each small Counter Weight Disc averages 1 oz. Each Camera Platform Weight Plate averages 6.6 ozs. 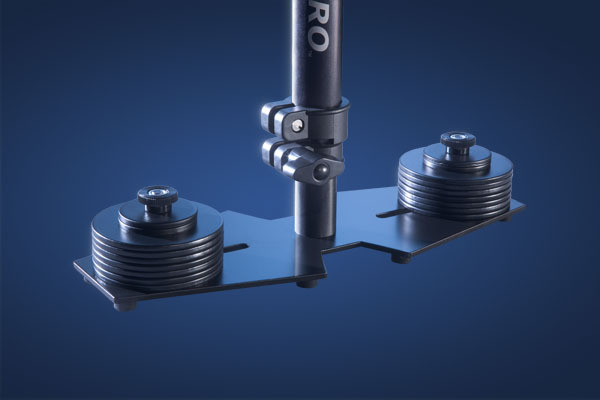 The Glidecam XR-PRO includes 14 large and 4 small Counter Weight Discs, and 4 large Camera Platform Weight Plates. 14 large Counter Weight Discs = 2 lbs. 1.12 ozs. 4 small Counter Weight Discs = 4 ozs. 4 large Camera Platform Weight Plates = 1 lb. 10.4 ozs. The Camera Mounting Top Plate has 1/4” and 3/8” mounting holes. The Base Platform has one 1/4” mounting hole for optional LCD Monitor attachment etc. 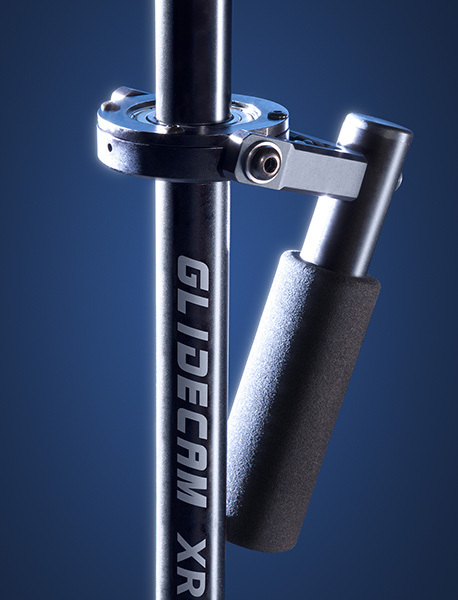 The Glidecam Forearm Support Brace is the first camera stabilization system designed to distribute the weight of the system over the entire forearm of the operator.